During the campaign, Ban was viewed by many as the least visible [of candidates for Secretary General] and offering the least objectionable views in order to not offend any governments. …With Ban at the helm, we may see the United Nations return to a more traditional “intergovernmental” role, working to consolidate the “supranational” gains achieved in the last decade. 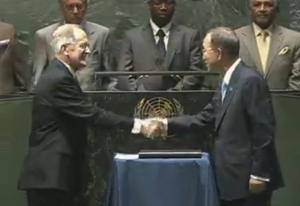 UN General Assembly President Joseph Deiss congratulates Ban Ki-moon after administering the oath the office. Ban has lived up to this prediction in his self-described role as “harmonizer” and “bridge-builder” on the challenges that have faced the world community in the past 4½ years. Kent Kille, author of “From Manager to Visionary,” offers insights in the leadership styles of Ban’s predecessors, and Ban appears to fall squarely into a more managerial style as did Kurt Waldheim, in contrast to Annan “strategic” leadership or Hammarskjöld’s “visionary” approach to the office. Critics, myself included, have raised concerns about Ban’s failure to confront “massive human rights abuses,” particularly in Asia, his absenteeism on the global economic crisis and proliferation issues, and questionable management practices. The desired response to each of these however may have required the leadership style more appropriate to one of Ban’s predecessor. On the other hand, Ban’s modest style succeeded in increasing global attention to climate change, women and children’s health issues, and responding to natural disasters. Ban deserves praise in these areas, and they reflect, as I portended in 2006, a Secretariat that would prefer to use the UN’s “intergovernmental” machinery and avoid advocating new norms or promoting “supranational” responses to crises. Should Ban have been re-elected to a second 5-year term? Yes, but conditionally. His re-election could bode well for the organization despite his leadership style and only if he resists his tendency to placate the more powerful UN members on human rights. A managerial approach works well when results are forthcoming, but this has not been the case for Ban. Governments did not respond to the two challenges which Ban prioritized upon taking office. His work on climate change resulted in a summit that observers recognized beforehand as a recipe for disaster and precious little has been accomplished in addressing the genocide in Darfur. Ban has been more assertive in the last few months in speaking out on the crises in Libya and the Ivory Coast. Now that he has secured Asia’s second term in holding the post, perhaps he will also find his voice in challenging China’s invitation to Sudan’s indicted president or the atrocities committed in Sri Lanka. Modesty will no longer serve Ban. He need not become a visionary or assertive leader, but he can make greater use of the bully pulpit to reiterate the expectation that governments are to respect the international laws, norms and institutions which they have themselves developed. I remain critical of Ban’s re-election in terms of the process, which I described last week as a “joke” given its hastiness and lack of transparency. That Ban announced his interest in a second term a mere 15 days prior to the General Assembly’s vote should concern any proponent of openness and accountability in leadership selection. This contradicts the well-developed processes used by the World Trade Organization, the World Health Organization and numerous other major multilateral organization. It even fails when compared against the questionable selection practices of the Bretton Woods institutions. With no formal nomination period, nor even an invitation by the President of the Security Council or General Assembly for additional nominations, the consideration of the sole nominee is questionable even by IMF standards. In that process, the Executive Board took the minimal accountability measures of providing for a 18-day nomination period and setting a decision date several weeks following a call for nominees. In 2006, Ban’s campaign for the top post required him to meet no specific qualifications, sit through no formal interviews and follow no official timeline in applying for the job. Nonetheless, the process was more open and transparent than any previous selection the organization’s history, including the Security Council announcing scheduled straw polls in advance, in contrast to the “private meeting” at which the Council re-nominated Ban this year. Detractors of this view may point out that Ban has been successful given his leadership style and that this was a re-appointment to the traditional second term, as if accountability in the process and the incumbent’s record of performance needn’t be considered. I disagree vehemently and fault the Security Council and member states for reverting to closed-door discussions and private interviews that defy accountability and transparency and does not respect merit-based global leadership. Appointment to the post of UN Secretary General deserves due and deliberative debate, and failure to give it such minimizes and disrespects the office and its occupant both.